Yes, that's also the first thing I saw when I captured the whole lap. The whole short-cut problem arose in 2012, especially before the Spanish Grand Prix in Barcelona. Since then we have been policing track limits more strictly and have begun to rework most sunk tyres on every single track. The wording of the rules must have changed as well but I don't remember exactly. I can also remember that in 2008 in GR SuperLiga, another Polish league there was a problem with cutting the Les Combes curve. I can't remember who was the one cutting actually, but it was either Malebo (Force India, yellow helmet - there is a photo from the same season viewtopic.php?p=103942#p103942) cutting or Malebo blowing the whistle, but anyway, part of the apex was covered by a tree and no one, apart from one or two drivers, knew there is actually no sunk tyre on the inside (it was the first Spykee's version of Spa) and they made quite significant use of this fact. I don't remember how that case concluded though. I think it's the dimensions of the actual track that cause so much trouble, it needs to be squeezed so much into the GR map that the track just physically can't have the proper smoothess and character. I wonder why it's used so often, it's a really unpleasant place to drive. This is good hard track, after 3 not finnished race on GRPL and 7-8 week on this track. Always nice to hear some of these old stories. Speaking of it, we have changed the sunk tyres quite substantially. 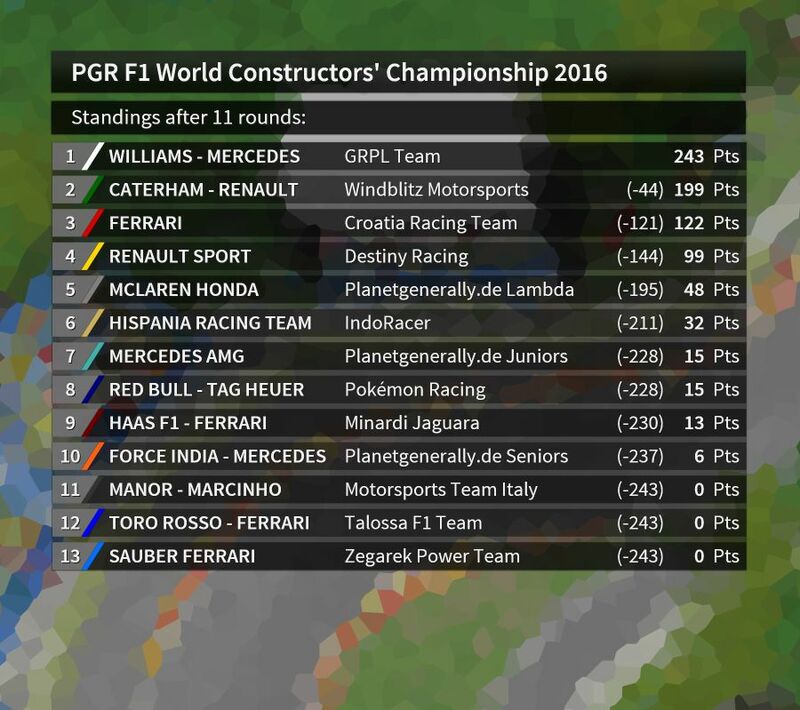 Only 11 Drivers in the Race - one crashed - good chance for points. 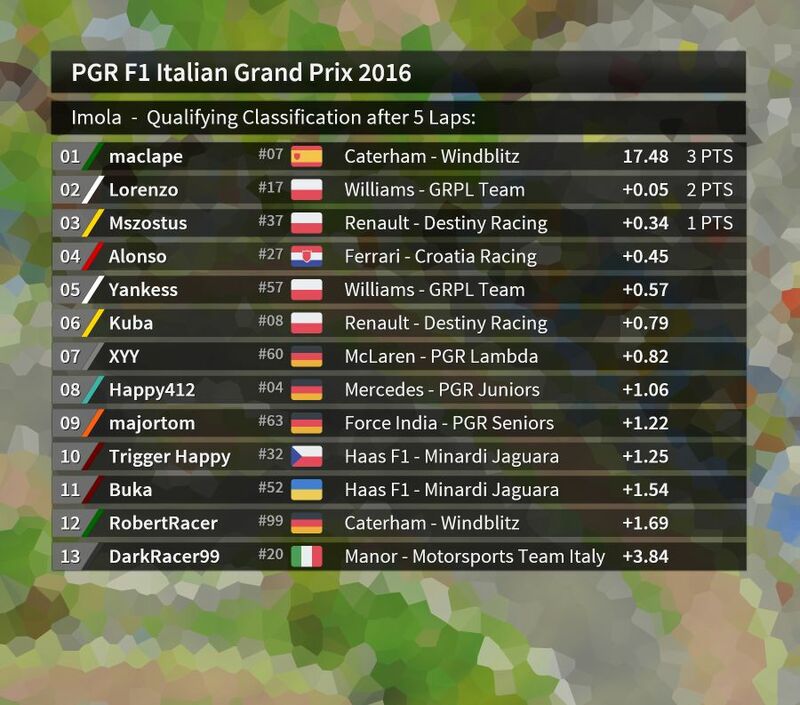 Login for Qualifying Imola is ready. "crashed" xD next time prepare the track properly, it's entirely your fault as organizers. I should be 5 secs in front of maclape if you counted my actual race. "crashed" xD next time prepare the track properly, it's entirely your fault as organisers. I should be 5 secs in front of maclape if you counted my actual race. For those who don't have a clue about what happened: One AI was ejected over the pit wall and continued cruising at pit lane speed on the track (and vice versa). After making a driving error all by himself which threw him into a concrete wall with no damage suffered, Lorenzo also crashed into the rear of that cruising car and quitted the game, hoping, as he said, to be permitted another login attempt. A courageous decision, considering that all of this happened a bit more than 3 hours before the deadline and not knowing whether or not this incident justifies a second chance. Then we have Alonso, who could have broken Kuba's record of 39 consecutive attended Grands Prix in the points (Qualifying and/or Race) if he had finished or completed one more lap then Lorenzo. Download the track update here! That's shame.I started my race, and then heavy wind opened(almost broke) my window and the rain(it rained literally whole weekend) started pouring into my room, so I think I've made the right call. 2nd podium on this season and 2nd worst race. - As a result they would pit and change for the fresh tyres more often instead of doing it only one time, rendering them more resistant during overtaking maneuvers. Later I continued this very race offline and, not surprisingly, since lap 3 it looked just like I said. And no, it was not any controversial racing incident that needs an investigation, it was a strong aberration that shouldn't have occurred and moreover it's your evident inadvertence (especially since you said you were well aware of this bug!) and the second chance in such case not what you have to ask for, it's something you should have by default. If you think differently then I'm really lost for words. The fact that it all happened 3 hours before deadline is unimportant as well. We always have 3 days to drive the race and everyone has the right to choose any moment of time within this range and even if someone decides to log in a minute before the deadline he still has every right to expect that in case of any problems the time will be effectively 'frozen' and the results will not be published at least until his case is resolved, even if that would mean extending the deadline to give him a second try if necessary. It's always been like that since I remember in any decent competition. It's quite astonishing that knowing my case you just published the results as if nothing happened, blaming me for encountering the bug. I also had an AI at Limiter Speed in one of my test races. Is this a thing to make money from or is it all about fun? For me it's about having fun and if I have to maneuver around the slow AI cars, I may not be as fast as I used to be, but it's a challenge as well. Please tell me where this was said. However I agree that it doesn't make a difference if this happens on Friday or three hours before the end of the deadline. Unexpected problems are part of the racing from the beginning of the sport. It happens sometimes, and here even less often than in real world. I understand how it is frustrating, I had similar situation with AI in - if I remember correctly - one of IES races 2 years ago and you know what? There will be next race where you can make up lost points and enjoy victory. Better luck next time. Well, I made a race restart 5 times during login because AI jumped over the wall and went over the limiter. During Canadian GP, one of AIs went incorrectly over pit limiter and it made a lot of problems for me - mainly due to the track. And I agree with Kuba. I had this kind of problem with last year's version. But only at the start and from grid position 11 to 20. So I changed the AI line and some of the grid spots and it worked perfectly. That's why I didn't add some invisible walls like I did in Malaysia for example. There was an easier way to fix it, a piece of high wall made of lights would have prevented it completely. @kuba: I have slighly different experiences, as I've had this kind of unexpected situations a few times over the years, and every time when I informed organizers about any kind of bug I encountered, there was no problem for them to admit to their mistake and provide an adjustment. As I said, it's not a racing incident that might happen from time to time, it's an organizers' fault that perverts the race, because they didn't provide equal conditions for every competitor, releasing the flawed track. Which, considering their usual attention to minor details, is even more surprising, that they would expect me to finish that race. If you make a reference to real life, then I'd like to let you know that in real life there also are situations in which the event is stopped, restarted or cancelled due to various and unexpected circumstances, which otherwise would have favoured some of the competitors. For any examples I refer you to your own experiences, I'm sure wou will find a few. What pisses me off most though is the lack of any information from majortom and Rudy about how the case develops. So yesterday evening I did the only thing that I could and made another, perfectly legit login attempt which could be considered. Last edited by Lorenzo on Wed Nov 09, 2016 11:11 pm, edited 1 time in total. I don't quite get why there are no equal conditions for all competitors, because I think everyone has the same chance that an AI screws up in a race, it's just very unlikely. Yes, a wall may have helped, but (a) Rudy didn't encounter problems in his testing and (b) now it's too late anyway. I know this doesn't really help, but if I was in that situation, I would have just raced on because I for myself consider this not as the fault of the compo organisers and I don't think that it's a reason to get a "new" login try. So I would also think it's unfair if you would get your race counted because there's no such thing in the rules as "the track is faulty, so I can have a second try". A restart obviously doesn't really work for competitions with login. According to elementary game theory, randomness and fairness are two totally different things Especially when we deal with randomness that massively exceeds the scope of randomness which we generally arrange by driving with AI instead of driving alone. Point b) is just what I said about not being informed yesterday, when there was time and we stayed in touch, but you're right that there might be still time for a final decision. At the very beginning the race was screwed to the degree that was virtually impossible to continue racing, as I explained before. And especially at this track. Check it yourself. Also, technically I could not tell whether the track that I downloaded for the second time several hours later was still the same or changed. I believe there is a way to check there is no mismatch of any kind, as Rudy and majortom surely have the adequate tools. I also had AI caught in speed limiter walking around (like XXY or who above), crashed in his rear few laps before end and had strategy compromised. And what? These things happen under login, once it's an advantage (e.g. 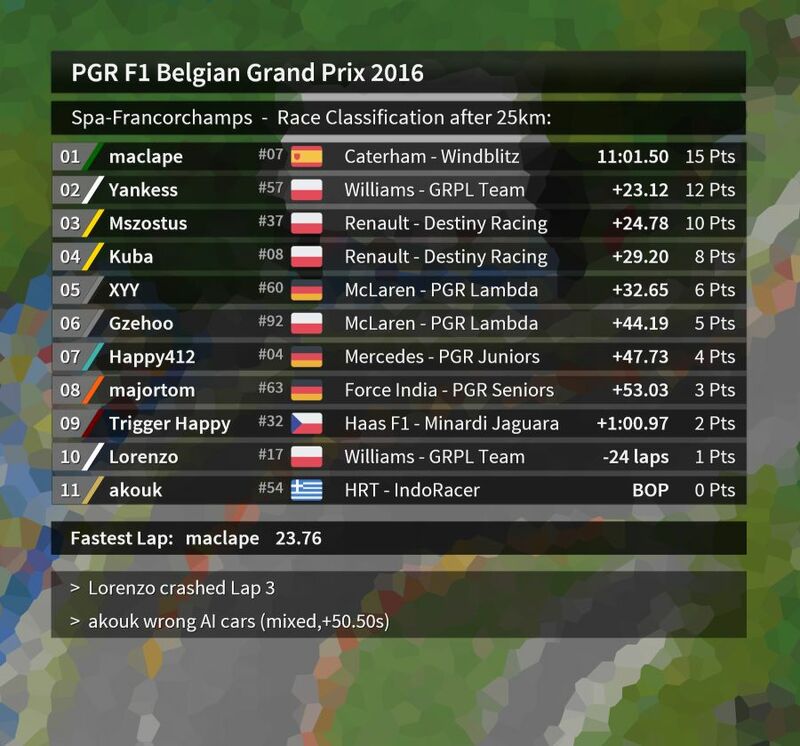 AI thrown behind walls), once a disadvantage (like this AI at Spa), logins aren't supposed to be restarted and the trk was same for everyone. A fair call by guys. A crying like a baby is boring, especially if it happens round after round over again. 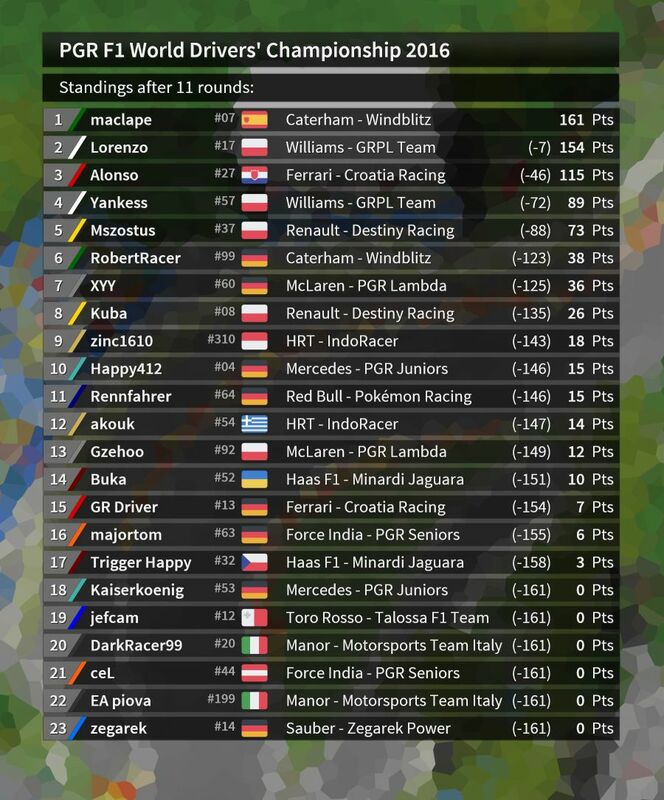 I guess it's not a big deal for someone who occupies last positions, but it's a really discouraging if you practice and hope for a good competition and to have a good race with maclape, which is instantly ruined because of the flawed track. In this context "the track is the same for everyone" is utterly ridiculous, because we could as well set a rule that there is 10% probability that you get automatically disqualified before even making the race. That would be equal for everyone as well, you can't say it wouldn't? - again, the fact that something is random doesn't imply fairness. I know various things can happen, and by definition we don't have equal chances in 100% (honestly, who first came up with that weird idea to race with AI? I'm wondering since 2009) but definitely a lot more could be done to prevent this situation, and approach to these kind things define the quality of the competition, which is very inconsistent if we speak of PGR this year IMHO. I won't catch that crying like a baby bait, it'd better if we kept the discussion focused on actual arguments, I think adding that was quite unworthy to your position. Every weekend brings something new, with that I can agree. What pisses me off most though is the lack of any information from majortom and Rudy about how the case develops. First of all, I really dislike your tone and conduct from time to time. This is really not how you should behave, especially when you think back how we communicatively handled the situation a couple of years ago when it was you, who "perverted" the Chinese Grand Prix by cheating - with the slight difference that this case was also fully intentional on your part. Still that does not make us treat the substance of your case any different as driver. The second thing that appears to me as a misconception of the truth is that there was "a lack of any information". Each of us wrote 3 PMs in the 3 hours between your failed attempt and the deadline, while I was outside coming home. So to everybody not involved our official explanation on the results table of you having crashed is a bit short to lay down the case. But you were also as quick as ever posting your discomfort right after our publication. And being honest, we had exchanged some words before and there has never been a case in history of PGR F1 when I did not type an essay about any so controversial decision afterwards. You contacted me saying that something had happened during your login that would certainly justify another try - without telling me what it was. In my answer I made very clear that I could only assume that the issue was indeed worthy of a second attempt. Because, in your first PM, you failed to give any explanation or description and I had no device with me capable of running GeneRally and checking your files. Based on this assumption my statement was that, generally but rarely, second tries are something that we have allowed in the past. I might add here, mostly in the case of technical problems of all sorts; maybe when something extraordinary happened on track but I couldn't name one such case out of my head. I also disclosed to you that there were some problems. We certainly would not let you and the wide majority of the field use the same login track twice. So we needed a new one before the deadline (yes, that is debatable), for which I had to successfully contact Majortom. Unfortunately, we had some additional anti-cheating measures in place this week, so I warned you that it might take a bit longer to prepare a new track that fits into the concept of what we wanted to investigate. You answered by saying "Never mind, I won't be able to make another run so late anyway". I would have advised you to keep going nonetheless - just to make sure that you have completed a full race because we might still decide that the underlying issue does not justify a restart or because we are not able to set up a new login track. Never did I say that an AI car jumping a pit limiter was a justifiable reason for a second attempt - on the contrary so. I was thinking to myself that we had such cases turned down before, but Majortom usually knows better, so there was no statement or speculation on my part in any of the PMs. I would still agree that your case is an unlucky one. We re-place the pit limiters and extend all the existing walls, cones etc. in a way that there is no chance to circumvent the pit limiters as long as the car is not completely airborne - btw. that's why (unlike your suggestion) invisible walls are better suited than lamp posts because they are infinite in height. Yet the problem that I experienced at the start, namely 1 AI was catapulted by the sunk tyres and went over the pit wall, was mainly due to the AI line and could be fixed by changing the approach of the cars between P11 and 20 to the chicane right ahead of them. I never experienced what happened to you during the race - only during the start. In your case there were 3 AI cars trying to squeeze themselves through the bus stop chicane. One of them was ejected over the pit wall. Usually, things like these are a bit harder to predict and they can happen everywhere when the AI is on rampage and their consequences are relatively minor. Sometimes cars, when ejected over the fence, never make it back, which can be a slight advantage, an upside that we would not contest by the way. So yes, it is a bit annoying to me that the additional measure that I had in mind to solve the problem at the start would have also helped under slightly different circumstances during your race. I said sorry for what happened in one of my PMs because subjectively what happened was unlucky and might not seem "fair" to everybody. But in real life fairness is normative and a category that we would like to use but can't for several reasons. Was your BOP in Australia fair when you used only slightly different settings? Could we have even made a decision that was "fair" to anybody? Re-emphasizing what we said in Australia, we are not capable (nor was it our job in that case) to evaluate by the tenths of a second how the potential result would have turned out if you had used the same settings as everybody else. We can only make sure that the initial conditions are equal for everybody. What happens afterwards might not always be fair - even in our subjective view and depending on the reference point - but it is far too complex to fiddle about. And then there are other things that should not go wrong in the first place if we judge them by our own standards. But these things don't have a bias, they just hit you randomly. That's why we did not say "Screw those drivers from P11 onwards. Let them have a higher risk of carnage at the start." I would not use this as an argument against your case but against your over-dramatization in language and argumentation. In retrospect your race was "screwed" to such a degree that you would have probably finished 2nd, which is not too different from your previous achievements - leaving all other potential ifs and buts aside. I can only assume that you were either naive or somewhat annoyed by your own mistake prior to your first encounter with the AI car, when you voluntarily quit the race altogether. Maybe that is also part of your frustration, which I can understand otherwise. Also, technically I could not tell whether the track that I downloaded for the second time several hours later was still the same or changed. I don't the see the point that you want to make here. You told me that you were not able to give it another go before the deadline, anyway. And I said that, although technically possible, another attempt on the same track is, figuratively speaking, not worth the bytes of storage in our mailbox. So at this point of time what I said was that "I will come back to you as soon as possible" to inform you when the new track is ready for you to proceed, which btw. does not equal some sort of unspoken decision that the underlying cause was found to be legit. Definitely a lot more could be done to prevent this situation, and approach to these kind things define the quality of the competition, which is very inconsistent if we speak of PGR this year IMHO. Preparation is the same for every track every week, that is why there are weekly track updates kicking in after the first few weeks of feedback. We also try to learn from the issues of previous years, just like the 2015 version of Spa-Francorchamps and the mentioned problems at the start. Admittedly, not all of our changes always work as expected but I would dare say that they don't aggravate things. So the past season must have been even worse from your point of view and all other things being equal. Summarizing all this, there were no obvious false promises on my part concerning a potential second attempt. So the point of controversy lies in your opinion that a known but seemingly fixed problem with the AI and the pit wall, which could still occur under slightly different and very unlikely circumstances and to everybody in the field, undoubtedly justifies another login attempt because and even though its relatively small disadvantages. Was there an obvious flaw that we failed to address and was eventually going to affect the drivers? No, because I did make some adjustments in that spot, which were generally suitable and seemed to solve (but in fact at least notably improved) the issue after testing and during the races of the other drivers, all of which it could have happened to. Still, somewhat erratic driving by the AI, including the abuse of objects, has always led to similar situations and is part of the game, which makes your case not a freak accident but a very unlucky and unpleasant one because my adjustments to the track did work to some extent but not perfectly. As well as other forms of erratic driving that wind up in one or more AIs being damaged, I can only remember comparable cases with negative consequences to the participant, in which there was no second attempt granted. 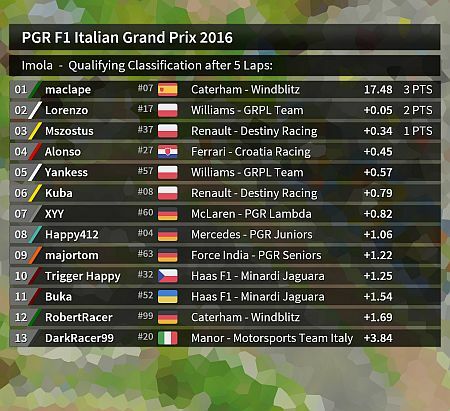 At the same time there are also a few cases in which we did not disallow the race result when the AI cars had taken each other out of the race, thus granting an advantage to the driver. We used to put that under bad or good luck and the inevitable GeneRally carnage. And please keep in mind, the consequences would have realistically been 3 points if you had only continued that race after both your mistake and the kiss with the AI. It's quite simple. Everybody race the same track. Everybody race with the same AI drivers. Qualifiying is part of a race weekend. If you qualifiy bad or lower than expected, you need to make up the ground in the race. 4 wheels outside the track there wiill be cutting or not? I might refer to some points of your comment someday when I will have time to get down to reading it. Starting Grid shall be ready on Friday - even late. Seems ok for me unless somebody raises objection? Last edited by majortom on Thu Nov 10, 2016 8:02 pm, edited 1 time in total. I asked because due to the chicane this might be a place where people might drive off the track even unintentionally and to avoid too much investigation after the race maybe it'd be better to place a sunk tyre there, just like before Piratella, just an idea. Sorry, I am seeing this and your previous post for the first time right now. 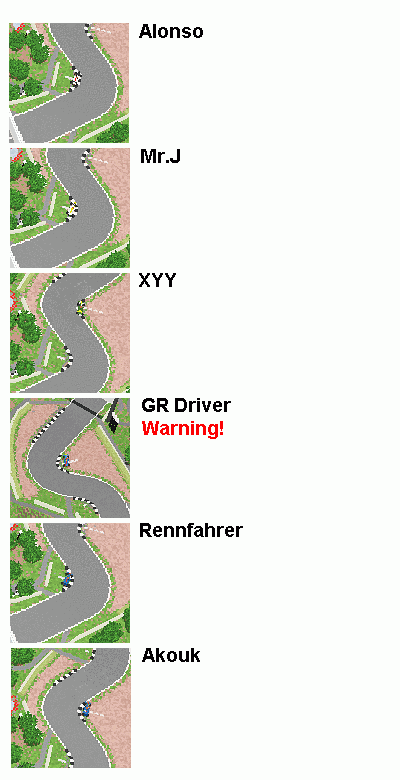 Luckily, the race version of the track is not yet online, so I will follow your suggestion and put something there. Comparing to the 2015 version, I added the sunks in Piratella as you have already mentioned, but I also took away what I think was an extended wall of hay bales right after the Variante Alta chicane (comparing to the original version). While testing, it seemed to me that it made sense to throw the old 2015 cars right into this chicane and take whatever exit results of it. Not so much with the 2016 cars, but I guess I am a real slowpoke around here as I tend not to hug the white lines or even the grass unless I'm about to turn in for a really sharp corner - and not a bend like that. So putting some sort of object in place would have been better judgment. So generally speaking, 4 wheels off track in qualifying has become more of an issue to us over the years and should be fully avoided if possible when there is no obstacle in the way. As Majortom showed on his pictures, both cars, the Williams more than the Ferrari, are somewhat touching the white line on the inside of the bend, which is still perfectly OK to us, but it might be a risky approach if drivers try to do it intentionally - and fail. Overstepping the track limits on the outside of a corner may also run you into serious trouble when we deem this kind of exit to be beneficial - in relative terms that is. Variante Alta was such a place in 2015 and possibly any other high-speed exit covered in grass or tarmac and tarmac run-offs in general. I like how this is like the real thing... not. Please do so in future cases when we seem to deviate from our general idea behind these statements. But I warn you, the text is not all explicatory.